Where did the universe come from? A person of faith would probably answer that the universe was created out of nothing, as stated in the first verse of the Torah. Such an answer was long considered a scientific impossibility, because it contradicted the law of the conservation of matter and energy. According to this law of science, which was established in the middle of the nineteenth century, matter and energy can be changed from one form to another, but something cannot come from nothing. Therefore, scientists viewed the universe as eternal, thus neatly avoiding questions regarding its origin. The Torah assertion that the universe was created, presumably from nothing, became an area of conflict between Torah and science. That is how matters stood for many years. This situation has now completely changed. The twentieth century witnessed an unprecedented explosion of scientific knowledge, which was nowhere more dramatic than in cosmology, the discipline that deals with the origin and development of the universe. Astronomers had been studying the heavenly bodies for thousands of years, but their studies dealt exclusively with charting the paths of the stars, planets, and comets, and determining their composition, spectrum, and other properties. The origin of the heavenly bodies remained a complete mystery. Today, an overwhelming body of scientific evidence supports the “big bang” theory of cosmology. Important advances in cosmology during the past few decades have, for the first time, permitted scientists to construct a coherent history of the origin of the universe. Today, an overwhelming body of scientific evidence supports the “big bang” theory of cosmology.1 There are four major pieces of evidence: (1) the discovery in 1965 of the remnant of the initial ball of light, (2) the hydrogen-to-helium ratio in the universe, (3) the Hubble expansion of the galaxies, and (4) the perfect black-body spectrum of the microwave background radiation measured by the COBE space satellite in 1990. Only the big bang theory can account for all these observations, and therefore this theory is now accepted by all mainstream cosmologists. When cosmologists use the term “creation,” to what are they referring? Precisely what object was created? Scientists have discovered that the universe began with the sudden appearance of an enormous ball of light, commonly called the “primeval light-ball.” This “explosion of light” was dubbed the “big bang” by British astrophysicist Fred Hoyle. The remnant of the initial ball of light was detected in 1965 by two American physicists, Arno Penzias and Robert Wilson, who were awarded the Nobel Prize for their discovery. People sometimes ask what existed before the big bang, the event that marked the creation of the universe. Professor John Wheeler of Princeton University explains that the very concept of time did not exist before the creation. “There was no ‘before’ prior to the Big Bang. The laws of nature came into existence together with the Big Bang, as did space and time.”7 Wheeler emphasizes that scientists view space and time as the “stage” upon which events take place. If there is no physical world – if the universe does not exist – then neither time nor space can exist. “Time” and “space” are not independent entities; these concepts have meaning only after the creation of the physical universe. This property of time and space can be illustrated by analogy to the concept of color. “Red” or “black” are not characteristics that are independent of any physical object. Only if macroscopic objects exist, such as grass, rocks, or houses, can one speak of these objects as being red or black. If nothing but atoms and molecules existed, then there would be no meaning to “red” or “black,” or to the entire concept of colour. There is no such thing as a red molecule. In the same way, there were no concepts of time and space before the universe came into being. In addition to confirming the creation of the universe, the discovery of the initial primeval light by Penzias and Wilson also answers another long-standing puzzle regarding the Torah account of creation. It is written in the Torah on the First Day of Creation: Andthere was light(Genesis 1:3). But at that time, there existed neither stars, nor sun, nor moon, nor people, nor any other known source of light. Therefore, how can one understand this “light”? Scientists have now discovered that therewas lightat the very beginning of time: the primeval light-ball whose appearance heralded the origin of the universe. 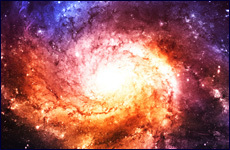 The creation of light did not occur within the existing universe. Rather, the creation of light was the creation of the universe. In other words, the Torah does not record two separate creations on the first day – the creation of the universe and the creation of light – but only one. We now turn to the question of the time scale. How much time was required for all the cosmological events that took place at the creation of the universe? How many millions of years had to elapse before the universe was complete and assumed its present form? All the cosmological events involved in the creation of the universe occurred within a very few minutes. The remarkable answer is that all the cosmological events involved in the creation of the universe occurred within a very few minutes. This fact is emphasized by the dramatic title that Nobel laureate Steven Weinberg chose for his famous book on modern cosmology: The First Three Minutes. Thus, the formation of the first atomic nuclei – the basic building blocks of every material – was completed within three minutes after the instant of creation. The comprehensive agreement between Torah and science described above does not prove that the Torah is of divine origin, nor does it prove that God exists. However, as we begin the twenty-first century, the person of faith is not forced to choose between accepting the latest scientific discoveries or accepting the Torah account of creation. All leading cosmologists now discuss the creation of the universe, while the Torah discusses the Creator of the universe. It is not unreasonable to assume that science and the Torah are both referring to one and the same subject. It is a pleasure for a person of faith to be living in this day and age! The scientific discoveries recorded above are exactly what one would expect if the Torah account of the origin of the universe was correct. Therefore, such harmony between Torah and science constitutes an important argument in support of our religious belief. Modern science has become a significant element in strengthening our ancient faith. 1. See N. Aviezer, 1990, In the Beginning (Ktav Publishing House: New York). 2. P. A. M. Dirac, 1972, Commentarii, vol. 2, no. 11, p. 15. 3. A. H. Guth, May 1984, Scientific American, p. 102. 5. J. Silk, 1989, The Big Bang (W. H. Freeman: New York), p. xi. 6. B. Greene, 1999, The Elegant Universe (Jonathan Cape: London), pp. 345-346. 7. J. A. Wheeler, 1998, Geons, Black Holes, and Quantum Foam (W. W. Norton: New York), p. 350. 8. Greene, pp. 347, 350. 9. J. B. Soloveitchik, Spring 1965, Tradition, pp. 5-67. 10. See the adaptation of the 1965 Soloveitchik essay (especially p. 8) by A. R. Besdin, 1989, Man of Faith in the Modern World (Ktav: New York), pp. 36-37. 11. S. J. Gould, 1989, Wonderful Life (W. W. Norton: New York), p. 14. 12. D. M. Raup, 1991, Extinctions: Bad Genes or Bad Luck? (Oxford University Press). 13. N. Eldredge, 1985, Time Frames (Simon and Schuster: New York), p. 87. 14. N. Eldredge and I. Tattersall, 1982, The Myths of Human Evolution (Columbia University Press: New York), p. 154. 15. G. Gale, December 1981, “Anthropic Principle,” Scientific American, pp. 114-122. 16. S. Mitton, editor-in-chief, 1987, The Cambridge Encyclopedia of Astronomy (Jonathan Cape: London), p. 125. As taken from, http://www.aish.com/jl/i/mn/Creation-A-Convergence-of-Torah-and-Science.html on August 11, 2017. Next Post ¿Dios puede crear una piedra que Él no puede levantar?